Fred. Olsen Cruise Lines’ 804-guest Black Watch will be entering dry dock at the Blohm + Voss shipyard in Hamburg, Germany in November 2016. The ship will undergo engineering works, general maintenance and refurbishment during the dry dock, as well as the creation of new public areas and guest facilities, as part of a multi-million Pound investment. Work on the dry dock is expected to start at Blohm + Voss on November 20, 2016. A key focus of Black Watch’s refurbishment will be the 423 cabins across the ship, on Marquee Deck 9, Bridge Deck 8, Lido Deck 7, Main Deck 5, Atlantic Deck 4, and Marina Deck 3. A new interactive in-cabin TV system will be installed across the ship, equipped with all the latest features and connectivity. Bathrooms will be refurbished, and all cabins will feature safes and mini-bars, as standard. “Black Watch is one of Fred. Olsen’s most popular cruise ships, and it is important that she always looks her best. During her 26-day dry dock in Hamburg, as well as the usual maritime inspections and maintenance work, we will also be undertaking major upgrades to the cabins and public areas throughout the ship, to ensure that we continue to provide the best facilities possible to meet our guests’ expectations. Black Watch’s Braemar Garden Café, on Lounge Deck 6, will be converted into a new restaurant, to be called ‘Brigadoon’, in keeping with Fred. Olsen’s close Scottish connections. The new restaurant will feature modern new décor and will offer a stylish, intimate dining experience, for up to 54 guests – continuing to serve British and international cuisine for which Fred. Olsen is renowned. The Braemar Courtyard, on Lounge Deck 6, will be converted into a separate speciality dining area ‘The Black Watch Room’, offering an à la carte dining experience, including expertly-prepared steaks cooked to order, with seating for up to 46 guests. A new dedicated Galley will be created to service this new dining facility. The existing Grill restaurant, situated on Lounge Deck 6 aft, by the main pool area, will be rebranded and redesigned, to offer a new Mediterranean-themed dining experience. Black Watch’s main 340-guest restaurant, The Glentanar, on Lounge Deck 6, will undergo extensive refurbishment, with a new layout, new furniture, carpet and curtains. Attention will also be given to the bar areas; the Observatory Lounge, on Marquee Deck 9, will receive a refresh to the décor and fittings, and the Lido Lounge, on Lido Deck 7, will receive an extensive overhaul, with new furniture, fabrics and carpets being fitted throughout, as well as the installation of a full-width sliding door to the aft. The Morning Light Pub will be moved to the area currently occupied by the Braemar Lounge, on Lounge Deck 6, replacing the existing Pub next to the Neptune Show Lounge. New furniture and fabrics will be a key feature of the larger, more spacious Pub, along with a new bar. The area vacated by the existing Morning Light Pub will be renamed the ‘Neptune Bar’. To enhance the onboard experience for guests, the Marina Cinema on Marina Deck 3 will be upgraded with the latest ‘3D’ technology, enabling the Black Watch team to show 3D films and other programmes. Black Watch’s Guest Services area, on Main Deck 5 – the focal point and ‘hub’ of the ship – will also be renewed, making it more inviting and user-friendly for guests. Similar refurbishments and upgrades are expected to the rest of the Fred. 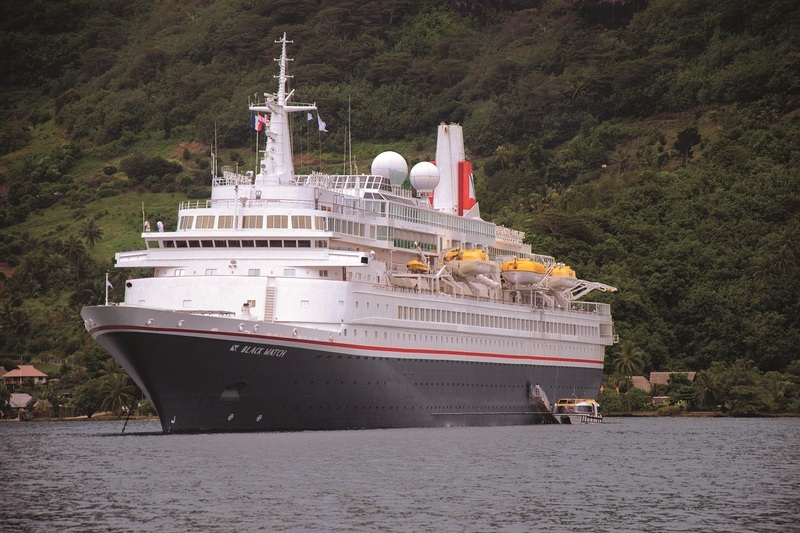 Olsen fleet – Balmoral, Braemar and Boudicca – in the coming years. Following Black Watch’s dry dock, the ship will recommence her cruise season from Tilbury, UK, with a seven-night ‘German & Danish Christmas Markets’ cruise, departing on 15th December 2016.